If you have been following this blog and our FB, you may notice by now that Cookie loves natural food such as raw fish, carrot peels, wheatgrass and fruits (apples and pears in particular). I believe that a natural diet is the best we can give to our furkids but preparing these everyday for Cookie is not practical for me (I don't even have time to cook for myself and Vincent everyday, let alone preparing natural and wholesome food for Cookie & Creme). 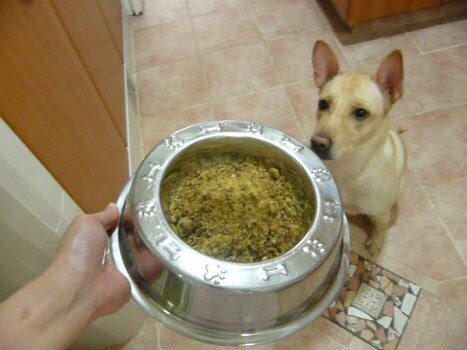 That's why we were very thrilled when Addiction Singapore invited us to try out their raw dehydrated food on Cookie. It's interesting to learn that some genius has come up with a unique process to gently air-dry raw, natural ingredients to produce convenient dehydrated food that retain all nature's goodness (enzymes, vitamins and minerals) that would otherwise be destroyed under high heat used in most processed knibbles. We were given the Perfect Summer Brushtail, containing over 45% wild brushtail (a marsupial the size of a cat), sunflower seeds, papayas, spinach and potatoes. Brushtail is known to be rich in omega 3. The rest of the ingredients are good sources of fibre, vitamin E, magnesium and selenium. When I opened the package, the raw dehydrated food resembles bak-hu (pork floss). It can be eaten dry as it is, like how we eat bak-hu. It can also be sprinkled on top of normal knibbles or cooked food as a topping (treat it like yu-chang or fried onion crisps). I also tried rehydrating the food with slightly warm water used to boil carrots. It'll swell up after absorbing the water, making the food porridge-like. Cookie absolutely likes both dry and wet version, although I would probably prefer the wet version because it encourages Cookie to lap and eat slower. Otherwise, she'll be swallowing the food the same way she gobbles down her knibbles. And I like that I can be creative with how this food is served, so that Cookie doesn't get bored. The following is a promotional message from Addiction Singapore. 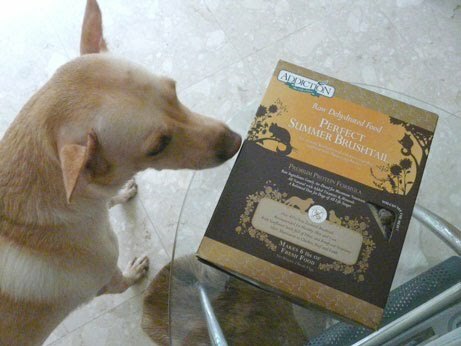 Specially for the readers of this blog, get 25% off Addiction Raw Dehydrafted Food (2lbs and 8lbs) when you purchase it at www.beary.com.sg with a Cookie's voucher code below! 5. Voucher code is valid till 31 August 2012. If you would like to review the product, there is a Love. Review.Win contest where Addiction Singapore is giving out free samples in exchange for a review. The review with most likes will win $500 worth of addiction pet foods. Go to Addiction Singapore's FB page to find out more.